President Serzh Sargsyan, who is the Kingdom of Belgium on a working visit, met today with the President of the European Commission Jean-Claude Juncker. The President expressed gratitude for the warm welcome and spoke with satisfaction about the substantial and busy schedule of his working visit to Brussels. He expressed hope that the discussions with President Tusk and President of EPP Daul, which were held in the atmosphere of openness, as well as the upcoming meetings with the EU High Representative Mogherini and the newly elected President of the European Parliament Tajani will unquestionably bring their contribution to the deepening of the Armenia-EU cooperation. Serzh Sargsyan highlighted the importance of the recent announcement made together with President Tusk on the conclusion of the negiations over the new Armenia-EU framework agreement, which were in progress for almost a year. According to the President, the new agreement will become a solid legal base for the deepening and developing the Armenia-EU relations in coming years, while mutual commitments enshrined in the document will also spearhead Armenia’s large-scale political and economic reforms, constituting the basis of the bilateral relations. President Sargsyan expressed hope that in addition to already reached agreements, the parties will soon start works aimed at the attraction to Armenia of the investments from the EU. At the same time, the President expressed hope that the EU assistance to the process of reformation in Armenia will be continuous. Serzh Sargsyan assessed as undeniable the fact that the cooperation with the EU has already stimulated advancement in the areas of economy, justice, state governance in Armenia and the strengthening of the democratic institutions for the protection of human rights and fundamental liberties. The parties spoke in detail about the Armenia-EU relations and their prospects. 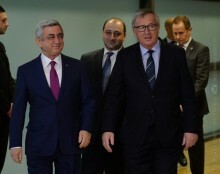 At the meeting with the President of the European Commission, President Sargsyan underscored that Armenia, which is a member to the Eurasian Economic Union, attaches a great importance to the development of the economic relations with the EU, striving to continue and move forward the reformation agenda in various areas. Discussed were also the situation in the region and recent developments. Serzh Sargsyan and Jean-Claude Juncker spoke also about the NK issue. The President of Armenia presented the recent develpoments and concerns related to the NK conflict resolution. President Sargsyan hailed the balanced position of the EU on a peaceful resolution of the Nagorno Karabakh conflict which concurs with the efforts and formulations of the only internationally mandated format of the Co-Chairs of the OSCE Minsk Group. The parties also exchanged views on the situation in the Middle East, including the crisis in Syria, spoke about the refugee problem and Armenia’s, along with many other countries’, humanitarian assistance to the friendly people of Syria and the Syrians of the Armenian descent.